After the revolutionary redesign, the new generation, half-ton GMC Sierra 1500 is more stylish, tech-loaded, efficient and comfortable and available again in multiple configurations. The fourth-generation Sierra 1500 has the unique, flashier styling and several innovations that make it distinctive compared to the corporate-related Chevy Silverado. Two models continue to share the same engine options and most of the mechanics and underpinning. The fourth-generation Sierra introduced also the new AT4 off-road ready version. As for the next 2020 GMC Sierra 1500 version, the model won’t come with the major upgrades. The new model year will bring new color options and possibly exterior and interior theme. The truck should also receive a full range of the engine options announced with the arrival of the new-generation version. There will also be some equipment regrouping. The 2020 GMC Sierra 1500 will continue to be based on GM’s T1 platform which also underpins other brand’s full-size trucks and SUVs. Thanks to the high-strength steel infusion the chassis is stronger while with the lightweight materials used for the body panels also provides reduced overall weight. The truck is up to 360 pounds lighter than in the previous generation while has a longer wheelbase as well. With the recent redesign, the light-duty Sierra also introduced the industry-first MultiPro tailgate which has six different functions providing easier loading and unloading as well as the easer cargo box access. The carbon fiber cargo bed is also the available option which saves 62 pounds providing also greater durability and damage resistance. The truck also benefits from the more modern styling since the recent redesign and the 2020 version will stay unchanged visually. The truck has more prominent and curvaceous, signature grille in the combination with the C-shaped headlights. The exterior of the model also defines the sculpted hood and squared-off lines and edges while also uses the C-pattern for the taillights. The truck will again vary the style and finish of the grille and body elements depending on three trim level. The black, body color or chrome elements will contribute to the style of the specific version and the truck maker will offer the wheel sizes ranging from 17 to 22 inches. The new light-duty Sierra will also stay in the same form regarding the interior design and available equipment. 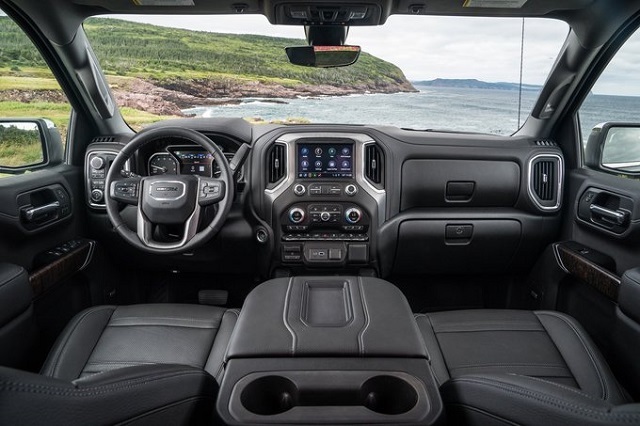 The truck shares the similar interior design with the Silverado model but adds a few specific trim accents. The model has well-organized controls and clear instrument panel and the latest infotainment system will also provide all modern features and quick response. The light-duty Sierra will come with the power locks, air conditioning, cloth upholstery, smartphone compatibility functions, and options like the keyless entry, power mirrors and more in the base version. The upper grades will boost the comfort and tech features to higher levels. The truck will be available with the leather upholstery, heated and ventilated seats, open-pore wood trim and more. The advanced safety systems will also be on the equipment list. The truck will provide a 360-degree view, forward collision warning and automatic emergency braking, blind-spot monitoring, rear cross-traffic alert, etc. 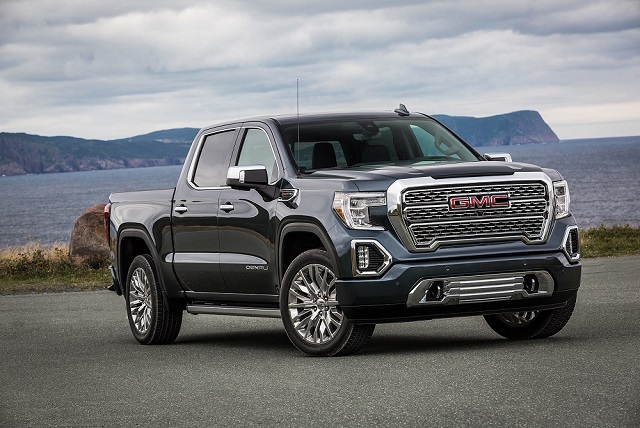 The 2020 GMC Sierra 1500 will come with the same roster of engine options and transmissions including the turbocharged and diesel units. The base, light-duty Sierra will use a 4.3-liter EcoTec3 V-6 engine with the power distribution of 285 hp and 305 lb-ft of torque. The six-speed automatic will be in this configuration and standard, rear-wheel drive. Familiar V-8 engine options will also return. A 5.3-liter EcoTec3 V-8 with the Dynamic Fuel Management technology will provide 355 hp and torque of 383 lb-ft paired with the 8-speed automatic transmission. A more robust 6.2-liter V-8 will be pair with the 10-speed automatic transmission and provide 420 hp and 460 lb-ft of torque. A recently added 2.7-liter turbocharged four-cylinder combined with the 8-speed automatic will also be an option. The 3.0-liter turbodiesel inline-6 will be in the conjunction with the 10-speed automatic transmission. The light-duty Sierra will load up to 2,240 pounds and tow up to 12, 200. The truck will also offer the adaptive dampers in the upper grades. For the off-road duties, the AT4 version will be equipped with the upgraded suspension, lifted ride height, skid plates, rear locking differential, etc. The 2020 GMC Sierra 1500 will hit the market next fall. The price will stay close to the current. The base Sierra costs from $33, 500.